The dream of an open and free internet isn't dead. Net neutrality — the principle that internet service providers must treat traffic equally, regardless of the source — is still seeing a strong fight waged on its behalf. This week, a group of 23 attorneys general from across the U.S., led by New York Attorney General Barbara Underwood, published a new brief reaffirming its dedication to the cause. The brief is the latest action in an ongoing lawsuit filed earlier this year by Underwood's predecessor A.G. Schneiderman. The group of attorneys general collectively represent over 165 million people, or approximately half the U.S. population. The group's lawsuit seeks to block the rollback of net neutrality by petitioning the U.S. Court of Appeals for the D.C. Circuit to reverse the FCC's order, which went into effect June 11th. In the new brief, the government petitioners argues that the FCC's order is "arbitrary and capricious," putting consumers at risk of abuse from their service providers, and that the order unlawfully prevents state and local regulations that conflict with the FCC's stance. 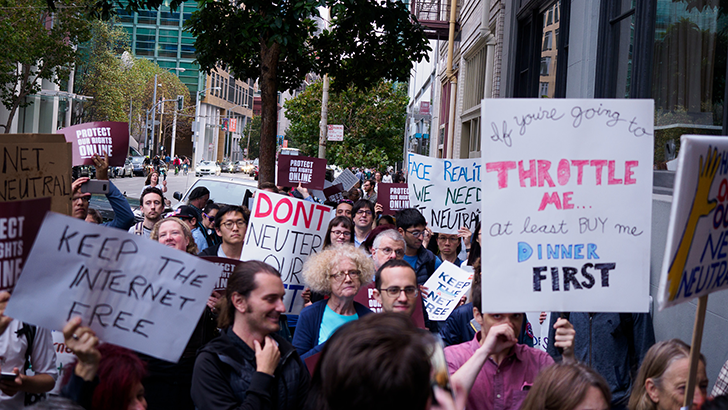 Companies are expressing support for the cause as well, including Mozilla, Vimeo, and Etsy, all of which have filed petitions to overturn the FCC's decision. The FCC voted to repeal net neutrality rules on December 14th, 2017, and while it may be an uphill battle, there's been much effort to revive them. A May Senate vote narrowly carried the motion to reverse the rollback, but the measure hasn't been voted on yet in the House. If it does eventually make it to President Trump, it doesn't seem likely he'll reverse the decision, considering he called net neutrality rules a "power grab" in 2014. Still, it's a battle worth having, and it's good to see a large group of government officials sticking with the cause.